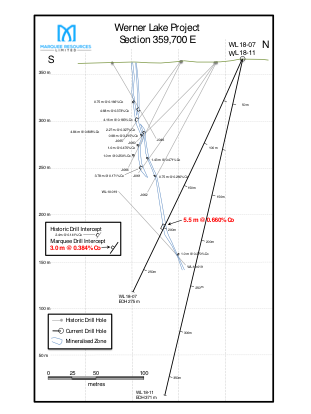 Vancouver, BC / TheNewswire / September 27, 2018 / Global Energy Metals Corporation TSXV:GEMC | OTCQB:GBLEF | FSE:5GE1 ("Global Energy Metals", the "Company" and/or "GEMC") is pleased to announce the following update regarding the continued exploration drilling program at its Werner Lake Cobalt project ("Werner Lake" and/or the "Project") located in Ontario, Canada. The Werner Lake exploration program is part of a $2.5 million commitment to advance the project and is being sole funded by Marquee Resources for an earn-in of up to 70% interest in the Project. Global Energy Metals currently owns 100% of the Werner Lake Project. The Private Placement will consist of the issuance of a maximum of 6,666,667 units (the "Units") at a subscription price of CAD$0.075 per Unit. Each Unit will be comprised of one common share of the Company (a "Share") and one transferable common share purchase warrant (a "Warrant"). Each Warrant will be exercisable to purchase an additional Share of the Company for a period of 12 months from the closing date ("Closing Date") at a price of CAD$0.15 subject to acceleration.